ESR | June 13, 2011 | Dalai Lama: "I am a Marxist"
Dalai Lama: "I am a Marxist"
There is no better way to proclaim your lack of spiritual and philosophical depth than by, two decades after the fall of communism, disclosing that you're Marxist. Yet this is precisely what Buddhist spiritual leader the Dalai Lama did during a speech before 150 Chinese students at the University of Minnesota this month. Journalist Tsering Namgyal reports on the story at Religion Dispatches, writing, "'as far as socio-political beliefs are concerned, I consider myself a Marxist.' 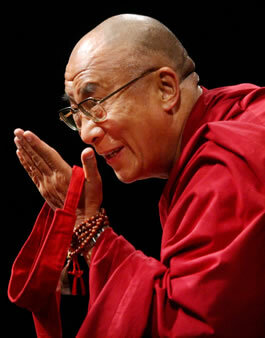 'But not a Leninist,' he [the Lama] clarified." Well, that's a relief. Those Leninists can really kill ya'. Marxists will just murder you. This isn't the first time the Lama indicated that his soul is as red as the robes he wears. During a lecture in NYC on May 19, the Tibetan leader credited "capitalism" with bringing new freedoms to China but then said, "Still I am a Marxist"; he then explained that Marxism has "moral ethics, whereas capitalism is only how to make profits." That's some deep thinking right there. Now, I have the word "capitalism" in quotation marks because it was originated by a communist, and we shouldn't allow enemies of the good to define the vocabulary of the debate. I prefer to call the mostly free market in question a "natural economy," as it is what naturally occurs when people are afforded economic freedom; they will buy, produce, sell and compete. In contrast, communism (in the real world, not in the stateless utopia of textbook fantasies) requires a large, intrusive, freedom-squelching government to micromanage people's endeavors and quash the yearnings of man's spirit. And because the Natural Economy does allow people the most freedom practical (we still must have courts to enforce contracts, for instance), it is infinitely morally superior to Marxism. Having said this, the Natural Economy doesn't have "moral ethics"; it just is. It is, again, what naturally occurs when man is permitted to spread his wings. And it will be as moral as the average people who operate within it. But while Marxism is morally inferior, it cannot be said to have "moral ethics" any more than the Natural Economy does – not in the true sense of the term. This is because it is atheistic. And a belief in morality – "morality" properly understood, that is – correlates to a belief in God. Why? Because what we call "morality" can originate with only one of two possible sources: Man or something outside of him. If it's something outside of and infinitely superior to him (i.e., God) – if "Absolute Truth" exists, in other words – then we can say that morality has an existence unto itself and is, therefore, real. But what if, as wanting Greek philosopher Protagoras said, "Man is the measure of all things"? Then morality doesn't really exist; the word is then just a confusing redundancy, a water-muddying term that we apply to what is nothing but man's consensus tastes. After all, we wouldn't say that chocolate ice cream was "bad" or "wrong" and vanilla "good" or "right" simply because we found out that the greater mass of humanity preferred the latter, would we? Yet is it any more logical to proclaim murder bad or wrong if the only basis for doing so is that the vast majority of the world prefers that we not kill in a way labeled unjust? If, as with ice cream, our attitude toward murder is just a matter of man's collective preference, then it lies in the same realm: taste. This is, by the way, what people of faith mean when they equate atheism with amorality. Secularists such as Christopher Hitchens take umbrage at this, but they misunderstand the concepts involved; no one is saying that an atheist cannot act morally – only that atheism cannot, logically, involve "morality." The Tibetan leader answered that the [sic] Marx was not against religion or religious philosophy per se but against religious institutions that were allied, during Marx's time, with the European ruling class. He also provided an interesting anecdote about his experience with Mao. He said that Mao had felt that the Dalai Lama's mind was very logical, implying that Buddhist education and training help sharpens [sic] the mind. He said he met with Mao several times, and that once, during a meeting in Beijing, the Chinese leader called him in and announced: "Your mind is scientific!" — an assessment that was followed by the famous line, "religion is poison." Well, I guess that with the Lama, flattery will get you everywhere. I've never heard the above interpretation of Marx before, and I very much doubt that he was a man of even private faith and non-institutionalized religion. Regardless, one of the most important points about Marx is never made: He was most likely what we would today call mentally ill. Note that he was notorious for not washing, and this is not uncommon for people who manifest crippling depression and other psychological/spiritual problems. And would it be surprising if Marx had been thus afflicted? "There is a fine line between genius and insanity," they say, and Marx was a classic case of a brilliant mind that was twisted enough to conjure up a truly batty theory. As for the Lama's mind, it doesn't seem as if he has to worry much about a slight misstep landing him in insanity's realm. A few years ago he was asked if he took exception to a highly sexualized image on a magazine cover, and he dodged the question politician-like, saying (I'm paraphrasing), "This world isn't real, anyway." Then why is he concerned about what the Chinese are doing in Tibet? What does it matter if the Chicomms oppress its people and quash its culture? Hey, if the Lama and some fellow Buddhist monks are hauled off to a Chinese concentration camp, they can just mediate on how it's all an illusion. The real illusion is the Lama's image. A man of authentic faith seeks Truth and doesn't deny reality, either the moral variety or the physical ("Am I a man who dreamt he was a worm or a worm dreaming he is a man?!"). The reality here, though, is that the Dalai Lama is, like Gandhi (about whom I recently wrote), just another overrated Eastern spiritual leader whom elites glom onto because he is quite liberal and not Western. He should stick to playing golf with Bill Murray on the bag.